Min Pins are considered a low maintenance dog in the grooming area. Despite the short coats, all dogs need a degree of grooming, both for the sake of a nice appearance and to maintain the coat and skin in a healthy condition. On a daily basis your min pins eyes and ears need to be checked for dirt and debris. Using a warm damp cotton ball or a soft washcloth gently go around the eyes removing any matter or dirt that has accumulated. The inside of the earflap needs to be wiped clean using a gentle touch. Look for any unusual build up of dirt or debris or an odor within the ear for this could be a sign that you need to contact your vet. At no time should you clean within the ear canal, clean only the portions of the ears that are clearly visible. Caring for your min pins feet must start at a very young age. As a young puppy with the litter your breeder began teaching your puppy to feel comfortable having his feet handled. This must continue on a regular basis for nail trimming to go smoothly. Handling your pup’s feet and massaging the nails on a daily basis greatly reduces the amount of stress on your min pin when he is in need of a nail trimming. Nails should be inspected regularly, and if overgrown must be clipped or filed back. Nails allowed to overgrow can cause lameness and deformities in the feet. Hold the foot over a light so the quick or the outer limit of the blood vessel, which runs through the nail can be seen. Using a nail clipper specifically made for animals, clip only the overhanging portion of the nail being careful not to cut into the blood vessel. When clipping a min pin with black nails the quick cannot be seen, one must be careful to only remove small portions of the nail until the dried brittle part of the nail is removed. For a perfect manicure and a finishing touch, file the nail so that it is smooth to the touch, removing any rough edges that can be caught on furniture or carpeting. A Min Pin does not require frequent bathing unless of course a wild roll in some stinky stuff has taken place or needs veterinarian prescribed bathing on regular intervals. Before placing your min pin into a tub or sink gently plug the ears with absorbent cotton balls being very careful not to injure the ear by inserting too deeply. Place the min pin into the bath and wet the coat thoroughly using warm water. Using a mild soap or gentle shampoo, start from the head and work the lather to the back then down the legs. Be very careful not to get the soap in the eyes. After working down the legs gently get the belly and chest area. Rinse well with clear water, using a sprayer if you have one. Once this is done wrap your min pin in a dry towel and vigorously rub him down for several minutes, often times this is all that is necessary. Keep your min pin warm and don’t allow outside for at least an hour. You can freshen up your min pin with a rub down using a Baby-wipe for those days between bathing. Your pup’s tail was docked when he was only a couple of days old. Very few owners have the choice to allow a tail to remain natural. Cropping the ears however is something you will need to think about, discuss with your breeder and ask about vet references for this procedure. 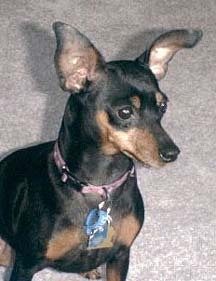 Having a pet Min Pins ears cropped is totally optional and most pet owners are opting to leave the ears natural. There basically are no health benefits to cropping the ears; today it is totally a cosmetic choice in the pet home. 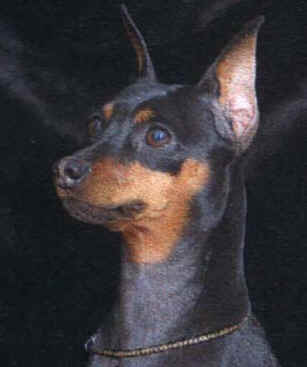 Ear cropping is done primarily now only on those min pins that is entering AKC conformation competition. The United States is one of the few areas of the world that has not banned such practice. A min pin entering conformation competition can compete with natural ears, and any min pin entering any other type of competition will not be faulted for having un-cropped ears. The cropping procedure is done as a surgery in which your pup will be put under anesthesia. Portions of the ear are cut away, the edges are stitched and both ears are put into what are called racks until they have trained or set to stand on their own. This can be a long process in which those not experienced with ear taping and training may find it is something they would rather not get involved in. 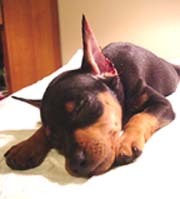 You should only use a vet for this procedure that is familiar not only with ear cropping but specifically experienced with Miniature Pinschers, preferably a vet recommended by your breeder. Many ask if there is any pain involved with ear cropping. The edges of the ears can be quite sore and tender for a few to several days after the surgery. 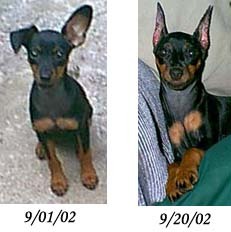 The aftercare you provide for you min pin’s ears will determine if the cropping will be the success you hoped for. Your vet and breeder will discuss the best aftercare for the ears with you. The most important thing to remember, it’s your choice. If you prefer a cropped look it is your duty and responsibility to ensure your pup’s health and comfort during the process. It does take work and dedication during the healing and training process. This is not something any owner can walk into without carefully weighing all the facts. If you like that natural look or feel that cropping is not something you wish to consider then that is fine also. For many reasons a home looking to add a Miniature Pinscher would prefer to adopt an adult Min Pin. This has many good advantages when compared to bringing home a baby as well as disadvantages. Finding an adult Min Pin to adopt requires you to use the same research, as you would do when looking for a responsible breeder. Many breeders may have adults that are looking for homes. Perhaps these are min pin that are being retired from the show rings and now need a wonderful retirement home, or a breeder; because they require placement contracts have had one of their puppies returned to them as an adult, and many breeders are actively involved in Min Pin rescue either on a local or national level. 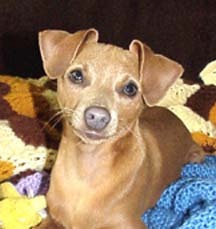 You also have the option to work with a Rescue Group that may have adult min pins that are waiting for homes. Just like researching responsible breeders, you should also do your research on rescue groups or individuals. Just as you can come across unethical breeders, you can also come across unethical rescue groups or individuals. There are many benefits to adopting an older Min Pin. 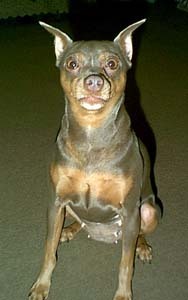 In most cases the min pin will be up-to-date on shots, already spayed or neutered and in many cases, already housebroke. The most touching aspect of adopting an adult min pin more often than not they will quickly fit into your family like they have been waiting on you all their life. Just perhaps, they Have! When you work with a rescue group your min pin has been evaluated for temperament and has lived in the home environment of their foster family for some time. The foster family will be able to fill you in on all the details of your Min Pin such as his likes and dislikes. Areas of training that may need more work, good habits, bad habits. I personally found adopting an adult min pin the most rewarding experience of my life.